Crush Your Hunger Pangs With One Healthy Drink! This caffeinated concoction will pick you up in no time and keep hunger on the back burner for hours to come. Trade in your high-calorie snacks for the ultimate hunger-fighting drink! Each of the ingredients in this mighty drink work to suppress your appetite. Together, well, let's just say we've found your new favorite recipe to use during any dieting phase. Coffee: Coffee consumption has been shown to have a positive impact on appetite suppression. It's thought that the combination of caffeine and chlorogenic compounds found in the coffee bean have a positive impact on appetite hormones. [2,3] Fortunately, both caffeinated and decaffeinated coffee have been shown to have a positive impact on hunger. So if you're watching your caffeine intake, you can still benefit from a decaf brew! 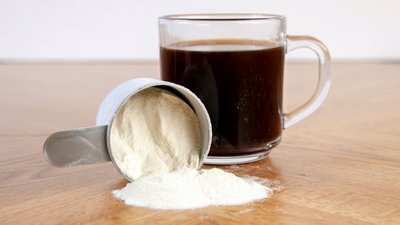 Protein Powder: Protein is an essential part of your weight-loss effort because of its ability to keep hunger in check. First, protein slows digestion, which keeps food in the stomach longer and ultimately promotes fullness. Protein consumption also triggers a cascade of hormone release, including gut hormones that send fullness signals to your brain. Ice: The combination of a lot of ice and the air from a minimum of 60 seconds of blending will turn one large glass of liquid into two or three. This bodes well for curing your hunger woes, because your stomach is a volume counter, rather than a calorie counter. The stretching of the stomach is a satiety signal in and of itself. By adding a lot of low-calorie fluid to your stomach, you mimic the feeling of having a large meal without the accompanying bloat or guilt you may typically feel! Armed with those simple ingredients, make your hunger-fighting shake. Here's how! Gavrieli, A., Karfopoulou, E., Kardatou, E., Spyreli, E., Fragopoulou, E., Mantzoros, C. S., & Yannakoulia, M. (2013). Effect of different amounts of coffee on dietary intake and appetite of normal‐weight and overweight/obese individuals. Obesity, 21(6), 1127-1132. Tremblay, A., Masson, E., Leduc, S., Houde, A., & Després, J. P. (1988). Caffeine reduces spontaneous energy intake in men but not in women.Nutrition Research, 8(5), 553-558. Greenberg, J. A., & Geliebter, A. (2012). Coffee, hunger, and peptide YY. Journal of the American College of Nutrition, 31(3), 160-166. Belza, A., Ritz, C., Sørensen, M. Q., Holst, J. J., Rehfeld, J. F., & Astrup, A. (2013). Contribution of gastroenteropancreatic appetite hormones to protein-induced satiety. The American Journal of Clinical Nutrition, 97(5), 980-989.